New Year’s Day sunset at neighbor Robert Trickey’s gorgeous house (and pool). Mahalo. Photo: © tablehopper.com. Aloha, dear readers! And Hau’oli Makahiki Hou (Happy New Year)! I hope you had a shiny transition into 2016 and that the only resolution you made was to enjoy life, because that’s assuredly one you’ll keep. I’m writing to you on my last full day in Hawaii before returning home to the mainland tomorrow, and you can bet I’m loath to leave the Big Island. 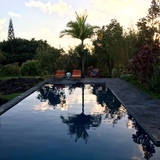 It has been a glorious week of balmy tropical weather, the cleanest plants I have ever seen (the rain gives them a constant bath), sleeping in an ohana cottage that is mostly made of screen windows (simply amazing! ), waking up to morning rainstorms, mongoose sightings, kooky farmers’ markets, eating my first soursop fruit, learning pidgin phrases, nighttime showers under the stars in an outdoor shower, falling asleep to the chirps of frogs and birds, hanging out with dear friends, partying in Craig Steely homes (thanks to Robert Trickey), cooking (and grinding! ), swimming in beautiful water (although the currents here are no joke), catching up on my reading, and going for night walks (the stars here are incroyable). Hawaii, you’re such a beaut! It has been a precious week of calm before I throw my life into overdrive and prepare for my (temporary) six-month move to New York. I leave for NYC on January 16th, so I’m only going to have 10 days to figure out what to pack and get my apartment in order. Mamma mia. As a friend said, “Coming in hot! Gonna need to foam the runway!” Truth. Today’s issue is just a shorty since I’m still on vacation (shaka). But you didn’t think I was going to let the new year start and not write up my annual rant, did you? No sir, no ma’am. Here’s this year’s installment of the bore: 10 things I don’t want to see in the new year. I’ll see you again this Friday, mahalo! Down the drain. Flickr photo by librarianishish. Thumbs down on all the bad ramen, and when it’s bad, it’s the same everywhere. Weak tonkotsu all over the place. Salty city. Sad noodles. Poorly prepared egg. Bamboo shoots that taste like a can. Chashu that had no love as a child. The list goes on and on. Octopus. Why so much octopus? I keep finding little octopus arms on plates all over the city. Let’s give this sensitive creature a break from the menu. Crappy grilled cheese. If you order a Cubano, or a grilled cheese sandwich, or a Reuben, or French onion soup, I want that damn cheese to be melted. Blistered. Runny. Oozing all over the damn place. HOT CHEESE. Like, gonna burn the roof of my mouth off, give it to me. Too many times I find rubbery, unmelted cheese in items that have melty cheese as their foundation. Fail! People will wait those extra few minutes for cheesy perfection. I promise. National food days. Who the hell cares if it’s National Pizza Day? It’s National PIzza Day every day in my book. And National Espresso Day. And National Cheese Lover’s Day. When is National Make It Stop Day? Rectangular dishes. 1994 called [with some smooth jazz playing in the background] and it wants them back. Unless I am eating maki or something off a skewer or some other elongated food worthy of a horizontal dish, there’s a reason plates are round: they’re easier to eat off of. Rectangular plates are trying too hard—all they succeed in doing is pushing your silverware to the edge of the table and your food off the plate. Square plates, also fired. I know, I know, this is about to be the biggest case of #firstworldproblems, but I get annoyed when a delivery person calls me on my phone and says, “I’m pulling up.” Oh yeah? That’s so great to hear. But I am still not getting out of this chair until I hear my front door buzzer. There’s a reason I called for delivery, and it’s probably because I’m in a caftan and my hair is a wreck and I’m barefoot and I don’t want to step foot outside. I’m tipping you well and probably paying an onerous delivery fee on top of it, so just bring the food to my door like delivery people are supposed to do, kthanksbai. How many boba and bubble tea places do we need in this fair city of ours? The vast majority of these shops are mediocre at best. It’s like they’re trying to be the next juice or smoothie or frozen yogurt shop that propagated like rabbits these past years. Slow your roll. Get ready for the Second Sunday Brunch Buffet at Parallel 37 at the Ritz-Carlton San Francisco. Photo courtesy of Parallel 37. The raw bar, full of fresh seafood. Photo courtesy of Parallel 37. Chef Michael Rotondo. Photo courtesy of Parallel 37. Looking for somewhere new to brunch? Ritz-Carlton Hotel brunch buffet spreads are pretty legendary—I remember the one they used to host on the patio at the Ritz-Carlton San Francisco fondly, and the one they hold in Half Moon Bay is also rather fabulous, so I was pleased to hear the ~RITZ-CARLTON SAN FRANCISCO~ is launching a Second Sunday Brunch Buffet at ~PARALLEL 37~. And with chef de cuisine Michael Rotondo leading the charge, it should be a good one. The first one will be Sunday January 10th, and after you make your way to the Bloody Mary bar, it seems the raw bar will be your next stop, with oysters, crab claws, shrimp, and other fresh seasonal seafood on offer. You’ll also be able to select dim sum, sushi, salads, local and international cheeses and charcuterie, and I’m always a fan of some hand-carved meats (prime rib, anyone?) and rack of lamb, which you’ll find at a “chef action station,” along with king salmon “Wellington” and eggs Benedict. Smoked salmon with mini bagels, paddlefish caviar with blinis, check and check. You can survey the entire sample menu here. As you have probably expected, it’s not cheap: the cost per person is $115, exclusive of tax and gratuity, but think of it like this: it will be your one opulent meal of the entire day! Brunch runs from 11am-2pm, and upcoming dates include February 14th (how’s that for a Valentine’s Day date? ), March 13th, April 10th, May 8th/Mother’s Day (book it! ), and many second Sundays moving forward. To place a reservation, visit parallel37sf.com or call 415-773-6198. Soon, specialty food professionals from around the world will head to Moscone Center for the Winter Fancy Food Show 2016, where they’ll explore the industry’s most delicious new trends and innovations. Join them and celebrate good times in support of a great cause at Party with a Purpose, the WFFS16 opening night event. Enjoy fantastic food and drinks, including craft beer donated by local brewery 21st Amendment, along with some rockin’ entertainment. Donations will be accepted to benefit the Specialty Food Foundation, whose mission is to reduce hunger and enrich lives. All attendees and exhibitors are welcome! It’s happening Sunday January 17th, from 5pm to 7pm in Moscone West. Open to trade professionals only. Learn more about Winter Fancy Food Show 2016 and register now!